In a time where BitTorrent users are increasingly concerned about their privacy, BitComet has added a long-awaited feature to its BitTorrent client. Originally intended to speed up downloads of users with limited upload capacity, BitComet's VIP service now adds support for fully anonymous downloads to prevent outsiders from monitoring users' transfers. Settled in China, the BitComet team has been steadily improving their BitTorrent client over the past several years. This work has resulted in some notable achievements in recent months. In April of this year BitComet was the first of all major BitTorrent clients to offer a stable 64-bit version. The 64-bit version allows for larger disk caches, something that may benefit heavy-duty downloaders. 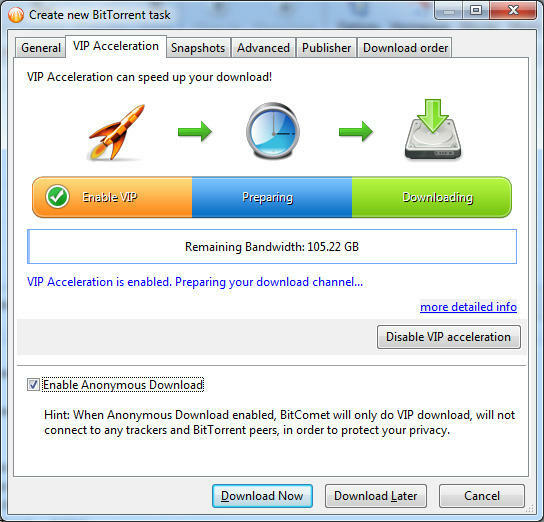 A few months before that, BitComet introduced another noteworthy feature called VIP-downloading, which enables users to download torrents that are accelerated by BitComet’s servers. The service is basically a private connection to a high-speed seedbox which accelerates the downloading process of healthy swarms. 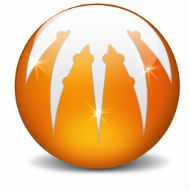 Today, this VIP service is expanded with the option to download all torrents anonymously. Instead of only accelerating regular BitTorrent transfers through Bitcomet’s servers, the “anonymous” downloads will be handled by BitComet’s VIP servers exclusively, hiding the IP-address of the user. “Our VIP servers are state of the art commercial servers on some of the worlds fastest connections. There are no imposed speed limits, the only account restrictions are on a flat-rate basis,” TorrentFreak was told. The catch, and yes there’s always one with anonymous downloading, is that the service comes at a cost. Aside from the free trial, BitComet offers plans with 10GB and 100GB limits for $4.99 and $19.99 respectively. Depending on one’s download behavior this could be a good deal, but heavy downloaders who are only interested in anonymity (and not acceleration) may be better off with an unlimited BitTorrent proxy or a VPN account. Starting today, anonymous downloads are supported by the latest Beta versions of BitComet. Thus far there’s plenty of interest for the VIP service. In fact, huge demand for the VIP free-trial accounts initially crippled BitComet’s servers which forced the developers to temporarily limit the offer to long-time BitComet users. We assume that the demand will only increase with the added anonymity feature. If no significant issues arise in the coming weeks, anonymous downloads will be added to the upcoming 1.28 release of BitComet. c There are 118 comments. Add yours?